Priced at $59.99, the LIFX Generation 3 bulb is the most expensive Wi-Fi Smart Color bulb in this roundup. It's also the most fully featured and the only one that boasts an 1100 lumens (75 W equivalent) output. It is available in the standard A19 configuration as well as a BR30 configuration that's suitable for both indoor and outdoor use. The third generation LIFX bulb features integration with Nest, IFTTT, SmartThings, Amazon Echo and Logitech Harmony, making it the best-integrated bulb in the roundup. Setting up the LIFX Bulb is very simple because it's all wizard based. Just download the app and launch it. The wizard prompts you to change to the bulb's default Wi-Fi network. After discovering the bulb, you are prompted to select your home Wi-Fi network from a list of available networks. After entering the Wi-Fi network's password, the wizard finishes setting up the bulb. You also set up an account with LIFX (or sign in if you already have an account) so that you have remote control over your LIFX product(s). The image below shows the LIFX bulb's home page just after the initial setup. There are menu tabs that you can open/close for lights, groups, and integrations. Additional groups appear on the home screen when you add schedules or scenes. From the Lights menu, you can see that there is one bulb installed with the default name LIFX Bulb. Under groups, there is one group (Office) and it shows that there is one light in that group. The LIFX Bulb icon below tells you three things: The light is on; it is set to full brightness because the circle around the light icon is a full circle and the color. If you tap the bulb name, a control for that light appears and looks like the screenshot below. 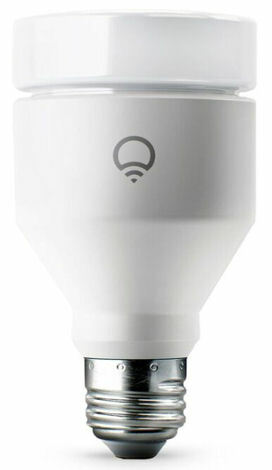 When first installed, the LIFX bulb defaults to white, so the white color control screen appears. Tapping the Edit icon in the control panel lets you rename the bulb, change location and groups, change Wi-Fi networks, and shows cloud status, model, and serial number. If you tap the share icon located below the Edit menu, you can share this color with your friends. You control the color temperature by dragging the circular dial clockwise/counterclockwise to position your choice of color temperature under the arrow or by just tapping on your preferred color. In the center of the color control dial, you control the brightness by moving your finger up and down on the control. An On/Off switch is at the bottom of the color circle. If you tap the Color icon at the bottom of the control panel a similar screen appears that gives you full control of all colors. The color control panel works just like the white control panel. You can tap on a color or drag and rotate the color you want to the circle located at the 12 O'clock position. The left image below shows that color temperature 76 was selected and that the brightness is 50%. The circle surrounding the light bulb above the control panel correspondingly is 50% filled and the color shows the color selected. LIFX also lets you control the saturation to give you more control over the light. To change the saturation, just drag the dot vertically, and watch the saturation level change on the bulb. The color remains the same - only the saturation is reduced. The icon above the color control panel changes to show the saturation level. As with the white control panel, there's also an on/off switch. The Windows 10 app, available in the Windows app store, looks a little different than the screenshots above. There are separate horizontal sliders brightness and color saturation. Actually, I like the mobile applications a little better than the Windows 10 app as they show you a numeric value for the color. The mobile apps, both Android and iOS also have a color history icon located in the upper-left corner of the screen. In the screenshots above the history "dot" is green. If you tap on that, it toggles back to the previously set color. Both of those features are missing in the Windows 10 app below. There are some other minor differences between the Windows 10 app and the mobile apps. First, the mobile apps both have 14 preset colors and 19 preset named color themes. The Windows 10 app doesn't have any preset color icons and only 10 themes which aren't named. The effects available in the Windows 10 app are somewhat different than in the mobile apps. It would be nice if the Windows 10 themes and effects were consistent with those found in the mobile apps. The composite screenshot below shows the presets and some of the named themes as well as the effects as shown using the Android app on a Samsung S7. Tapping on a preset color changes the color of the bulb to the selected color. Tapping on a theme changes the color to a preset color, brightness and saturation setting. You can go back to the color control panel to see the settings for each theme if you are interested. Each effect is configurable as shown in the example below. The LIFX mobile apps appear to be more fully featured than the Windows 10 app. LIFX has excellent scheduling features including time of day and sunrise/sunset schedules. Schedules created on the mobile apps appear on both platforms. However, schedules and scenes created on mobile apps don't appear in the Windows 10 app. Nor does the Windows 10 app have the ability to create schedules or scenes. You can, however, pin any of the four menus to the Windows 10 start menu. The image below shows the LIFX scheduling options. For this schedule, I configured the Desk lamp to turn on at sunset on weekdays at 30% brightness, using the color blue, and to use a fade-in time of 5 seconds. There are actually two LIFX Skills available through the Alexa app. The "LIFX Optimized for Smart Home" skill lets you turn lights or Alexa groups on/off and set brightness. You can use traditional commands like "Alexa, turn on Desk lamp at 50%". This skill has the LIFX logo with a white bulb on a purple background. The second LIFX skill that has a purple bulb on a white background enables you to control and set colors for groups, but not individual devices. For this skill, you have to use the syntax, "Alexa, tell LIFX to set the office lights to red". You are limited in the colors supported by the Alexa skill to red, orange, yellow, green, cyan, blue, purple, pink or white. If you attempt to choose an unsupported color such as magenta, Alexa will recite the list of supported colors to you. Your LIFX bulbs are easily controlled by IFTTT. You can choose from many LIFX applets published by other IFTTT users or easily create your own. The LIFX support site has an article to help you. Using Weather Underground as a service, I created an applet that would blink my Desk lamp five times using the color blue when the temperature drops below 25 degrees. Using advanced options you can specify color, saturation, brightness, number of blinks and fade in/fade out times.